Sleep apnea, also spelled sleep apnoea, is a sleep disorder characterized by pauses in breathing or periods of shallow breathing during sleep. Each pause can last for a few seconds to a few minutes and they happen many times a night. In the most common form, this follows loud snoring. There may be a choking or snorting sound as breathing resumes. As it disrupts normal sleep, those affected may experience sleepiness or feel tired during the day. In children it may cause problems in school or hyperactivity. There are three forms of sleep apnea: obstructive (OSA), central (CSA), and a combination of the two called mixed. OSA is the most common form. Risk factors for OSA include being overweight, a family history of the condition, allergies, a small airway, and enlarged tonsils. In OSA, breathing is interrupted by a blockage of airflow, while in CSA breathing stops due to a lack of effort to breathe. People with sleep apnea may not be aware they have it. In many cases it is first observed by a family member. Sleep apnea is often diagnosed with an overnight sleep study. For a diagnosis of sleep apnea, more than five episodes an hour must occur. Treatment may include lifestyle changes, mouthpieces, breathing devices, and surgery. Lifestyle changes may include avoiding alcohol, losing weight, stopping smoking, and sleeping on one’s side. 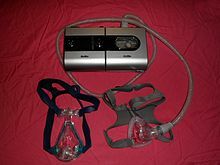 Breathing devices include the use of a CPAP machine. Without treatment sleep apnea may increase the risk of heart attack, stroke, diabetes, heart failure, irregular heartbeat, obesity, and motor vehicle collisions. OSA affects 1 to 6% of adults and 2% of children. It affects males about twice as often as females. While people at any age can be affected it occurs most commonly among those 55 to 60 years old. Central sleep apnea affects less than 1% of people. A type of central sleep apnea was described in the German myth of Ondine’s curse where when asleep the person would forget to breathe. Due to the disruption in daytime cognitive state, behavioral effects may be present. These can include moodiness, belligerence, as well as a decrease in attentiveness and energy. These effects may become intractable, leading to depression. There is evidence that the risk of diabetes among those with moderate or severe sleep apnea is higher. There is increasing evidence that sleep apnea may lead to liver function impairment, particularly fatty liver diseases (see steatosis). Finally, because there are many factors that could lead to some of the effects previously listed, some people are not aware that they have sleep apnea and are either misdiagnosed or ignore the symptoms altogether. Alcohol, sedatives and tranquilizers may also promote sleep apnea by relaxing throat muscles. Smokers have sleep apnea at three times the rate of people who have never smoked. High blood pressure is very common in people with sleep apnea. When breathing is paused, carbon dioxide builds up in the bloodstream. Chemoreceptors in the blood stream note the high carbon dioxide levels. The brain is signaled to wake the person sleeping and breathe in air. Breathing normally will restore oxygen levels and the person will fall asleep again. Sleep apnea may be diagnosed by the evaluation of symptoms, risk factors and observation, (e.g., excessive daytime sleepiness and fatigue) but the gold standard for diagnosis is a formal sleep study (polysomnography, or sometimes a reduced-channels home-based test). A study can establish reliable indices of the disorder, derived from the number and type of event per hour of sleep (Apnea Hypopnea Index (AHI), or Respiratory Disturbance Index (RDI)), associated to a formal threshold, above which a patient is considered as suffering from sleep apnea, and the severity of their sleep apnea can then be quantified. Mild OSA (Obstructive Sleep Apneas) ranges from 5 to 14.9 events per hour, moderate OSA falls in the range of 15–29.9 events per hour, and severe OSA would be a patient having over 30 events per hour. Despite this medical consensus, the variety of apneic events (e.g., hypopnea vs apnea, central vs obstructive), the variability of patients’ physiologies, and the inherent shortcomings and variability of equipment and methods, this field is subject to debate. Within this context, the definition of an event depends on several factors (e.g., patient’s age) and account for this variability through a multi-criteria decision rule described in several, sometimes conflicting, guidelines. One example of a commonly adopted definition of an apnea (for an adult) includes a minimum 10 second interval between breaths, with either a neurological arousal (a 3-second or greater shift in EEG frequency, measured at C3, C4, O1, or O2) or a blood oxygen desaturation of 3–4% or greater, or both arousal and desaturation. Oximetry, which may be performed over one or several nights in a person’s home, is a simpler, but less reliable alternative to a polysomnography. The test is only recommended when requested by a physician and should not be used to test those without symptoms. Home oximetry may be effective in guiding prescription for automatically self-adjusting continuous positive airway pressure. There are three types of sleep apnea. OSA accounts for 84%, CSA for 0.4%, and 15% of cases are mixed. Screenshot of a PSG system showing an obstructive apnea. No airway obstruction during sleep. Obstructive sleep apnea (OSA) is the most common category of sleep-disordered breathing. The muscle tone of the body ordinarily relaxes during sleep, and at the level of the throat the human airway is composed of collapsible walls of soft tissue which can obstruct breathing. Mild occasional sleep apnea, such as many people experience during an upper respiratory infection, may not be significant, but chronic severe obstructive sleep apnea requires treatment to prevent low blood oxygen (hypoxemia), sleep deprivation, and other complications. Individuals with low muscle tone and soft tissue around the airway (e.g., because of obesity) and structural features that give rise to a narrowed airway are at high risk for obstructive sleep apnea. The elderly are more likely to have OSA than young people. Men are more likely to suffer sleep apnea than women and children are, though it is not uncommon in the last two population groups. The risk of OSA rises with increasing body weight, active smoking and age. In addition, patients with diabetes or “borderline” diabetes have up to three times the risk of having OSA. Common symptoms include loud snoring, restless sleep, and sleepiness during the daytime. Diagnostic tests include home oximetry or polysomnography in a sleep clinic. Some treatments involve lifestyle changes, such as avoiding alcohol or muscle relaxants, losing weight, and quitting smoking. Many people benefit from sleeping at a 30-degree elevation of the upper body or higher, as if in a recliner. Doing so helps prevent the gravitational collapse of the airway. Lateral positions (sleeping on a side), as opposed to supine positions (sleeping on the back), are also recommended as a treatment for sleep apnea, largely because the gravitational component is smaller in the lateral position. Some people benefit from various kinds of oral appliances such as the Mandibular advancement splint to keep the airway open during sleep. Continuous positive airway pressure (CPAP) is the most effective treatment for severe obstructive sleep apnea but oral appliances are considered a first line approach equal to CPAP for mild to moderate sleep apnea according to the AASM parameters of care. There are also surgical procedures to remove and tighten tissue and widen the airway. Snoring is a common finding in people with this syndrome. Snoring is the turbulent sound of air moving through the back of the mouth, nose, and throat. Although not everyone who snores is experiencing difficulty breathing, snoring in combination with other risk factors has been found to be highly predictive of OSA. The loudness of the snoring is not indicative of the severity of obstruction, however. If the upper airways are tremendously obstructed, there may not be enough air movement to make much sound. Even the loudest snoring does not mean that an individual has sleep apnea syndrome. The sign that is most suggestive of sleep apneas occurs when snoring stops. Other indicators include (but are not limited to): hypersomnolence, obesity BMI >30, large neck circumference (16 in (410 mm) in women, 17 in (430 mm) in men), enlarged tonsils and large tongue volume, micrognathia, morning headaches, irritability/mood-swings/depression, learning and/or memory difficulties, and sexual dysfunction. The term “sleep-disordered breathing” is commonly used in the U.S. to describe the full range of breathing problems during sleep in which not enough air reaches the lungs (hypopnea and apnea). Sleep-disordered breathing is associated with an increased risk of cardiovascular disease, stroke, high blood pressure, arrhythmias, diabetes, and sleep deprived driving accidents. When high blood pressure is caused by OSA, it is distinctive in that, unlike most cases of high blood pressure (so-called essential hypertension), the readings do not drop significantly when the individual is sleeping. Stroke is associated with obstructive sleep apnea. It has been revealed that people with OSA show tissue loss in brain regions that help store memory, thus linking OSA with memory loss. Using magnetic resonance imaging (MRI), the scientists discovered that people with sleep apnea have mammillary bodies that are about 20 percent smaller, particularly on the left side. One of the key investigators hypothesized that repeated drops in oxygen lead to the brain injury. Screenshot of a PSG system showing a central apnea. In pure central sleep apnea or Cheyne–Stokes respiration, the brain’s respiratory control centers are imbalanced during sleep. Blood levels of carbon dioxide, and the neurological feedback mechanism that monitors them, do not react quickly enough to maintain an even respiratory rate, with the entire system cycling between apnea and hyperpnea, even during wakefulness. The sleeper stops breathing and then starts again. There is no effort made to breathe during the pause in breathing: there are no chest movements and no struggling. After the episode of apnea, breathing may be faster (hyperpnea) for a period of time, a compensatory mechanism to blow off retained waste gases and absorb more oxygen. While sleeping, a normal individual is “at rest” as far as cardiovascular workload is concerned. Breathing is regular in a healthy person during sleep, and oxygen levels and carbon dioxide levels in the bloodstream stay fairly constant. Any sudden drop in oxygen or excess of carbon dioxide (even if tiny) strongly stimulates the brain’s respiratory centers to breathe. In central sleep apnea, the basic neurological controls for breathing rate malfunction and fail to give the signal to inhale, causing the individual to miss one or more cycles of breathing. If the pause in breathing is long enough, the percentage of oxygen in the circulation will drop to a lower than normal level (hypoxaemia) and the concentration of carbon dioxide will build to a higher than normal level (hypercapnia). In turn, these conditions of hypoxia and hypercapnia will trigger additional effects on the body. Brain cells need constant oxygen to live, and if the level of blood oxygen goes low enough for long enough, the consequences of brain damage and even death will occur. However, central sleep apnea is more often a chronic condition that causes much milder effects than sudden death. The exact effects of the condition will depend on how severe the apnea is and on the individual characteristics of the person having the apnea. Several examples are discussed below, and more about the nature of the condition is presented in the section on Clinical Details. In any person, hypoxia and hypercapnia have certain common effects on the body. The heart rate will increase, unless there are such severe co-existing problems with the heart muscle itself or the autonomic nervous system that makes this compensatory increase impossible. The more translucent areas of the body will show a bluish or dusky cast from cyanosis, which is the change in hue that occurs owing to lack of oxygen in the blood (“turning blue”). Overdoses of drugs that are respiratory depressants (such as heroin, and other opiates) kill by damping the activity of the brain’s respiratory control centers. In central sleep apnea, the effects of sleep alone can remove the brain’s mandate for the body to breathe. Physiologic effects of central apnea: During central apneas, the central respiratory drive is absent, and the brain does not respond to changing blood levels of the respiratory gases. No breath is taken despite the normal signals to inhale. The immediate effects of central sleep apnea on the body depend on how long the failure to breathe endures. At worst, central sleep apnea may cause sudden death. Short of death, drops in blood oxygen may trigger seizures, even in the absence of epilepsy. In people with epilepsy, the hypoxia caused by apnea may trigger seizures that had previously been well controlled by medications. [verification needed] In other words, a seizure disorder may become unstable in the presence of sleep apnea. In adults with coronary artery disease, a severe drop in blood oxygen level can cause angina, arrhythmias, or heart attacks (myocardial infarction). Longstanding recurrent episodes of apnea, over months and years, may cause an increase in carbon dioxide levels that can change the pH of the blood enough to cause a respiratory acidosis. Some people with sleep apnea have a combination of both types; its prevalence ranges from 0.56% to 18%. The condition is generally detected when obstructive sleep apnea is treated with CPAP and central sleep apnea emerges. The exact mechanism of the loss of central respiratory drive during sleep in OSA is unknown but is most likely related to incorrect settings of the CPAP treatment and other medical conditions the person has. The treatment of obstructive sleep apnea is different than that of central sleep apnea. Treatment often starts with behavioral therapy. Many people are told to avoid alcohol, sleeping pills, and other sedatives, which can relax throat muscles, contributing to the collapse of the airway at night. For moderate to severe sleep apnea, the most common treatment is the use of a continuous positive airway pressure (CPAP) or automatic positive airway pressure (APAP) device. These splint the person’s airway open during sleep by means of pressurized air. 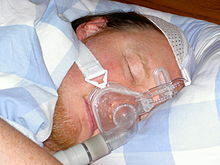 The person typically wears a plastic facial mask, which is connected by a flexible tube to a small bedside CPAP machine. With proper use, CPAP improves outcomes. Whether or not it decreases the risk of death or heart disease is controversial with some reviews finding benefit and others not. This variation across studies might be driven by low rates of compliance—analyses of those who use CPAP for at least four hours a night suggests a decrease in cardiovascular events. Evidence suggests that CPAP may improve sensitivity to insulin, blood pressure, and sleepiness. Long term compliance, however, is an issue with more than half of people not appropriately using the device. Although CPAP therapy is effective in reducing apneas and less expensive than other treatments, some people find it uncomfortable. Some complain of feeling trapped, having chest discomfort, and skin or nose irritation. Other side effects may include dry mouth, dry nose, nosebleeds, sore lips and gums. Excess body weight is thought to be an important cause of sleep apnea. In weight loss studies of obese and overweight individuals, those who lose weight show reduced apnea frequencies and improved Apnoea–Hypopnoea Index (AHI) compared to controls. 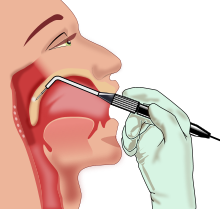 Illustration of surgery on the mouth and throat. Several surgical procedures (sleep surgery) are used to treat sleep apnea, although they are normally a third line of treatment for those who reject or are not helped by CPAP treatment or dental appliances. Surgical treatment for obstructive sleep apnea needs to be individualized to address all anatomical areas of obstruction. Often, correction of the nasal passages needs to be performed in addition to correction of the oropharynx passage. Septoplasty and turbinate surgery may improve the nasal airway. 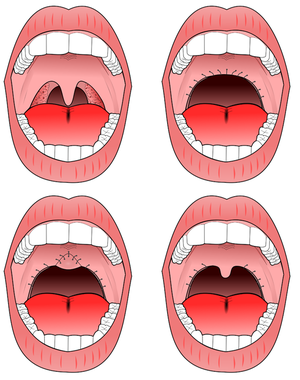 Tonsillectomy and uvulopalatopharyngoplasty (UPPP or UP3) are available to address pharyngeal obstruction. Uvulopalatopharyngoplasty. A) pre-operative, B) original UPPP, C) modified UPPP, and D) minimal UPPP. The “Pillar” device is a treatment for snoring and obstructive sleep apnea; it is thin, narrow strips of polyester. Three strips are inserted into the roof of the mouth (the soft palate) using a modified syringe and local anesthetic, in order to stiffen the soft palate. This procedure addresses one of the most common causes of snoring and sleep apnea — vibration or collapse of the soft palate. It was approved by the FDA for snoring in 2002 and for obstructive sleep apnea in 2004. A 2013 meta-analysis found that “the Pillar implant has a moderate effect on snoring and mild-to-moderate obstructive sleep apnea” and that more studies with high level of evidence were needed to arrive at a definite conclusion; it also found that the polyester strips work their way out of the soft palate in about 10% of the people in whom they are implanted. Base-of-tongue advancement by means of advancing the genial tubercle of the mandible, tongue suspension, or hyoid suspension (aka hyoid myotomy and suspension or hyoid advancement) may help with the lower pharynx. Other surgery options may attempt to shrink or stiffen excess tissue in the mouth or throat; procedures done at either a doctor’s office or a hospital. Small shots or other treatments, sometimes in a series, are used for shrinkage, while the insertion of a small piece of stiff plastic is used in the case of surgery whose goal is to stiffen tissues. Maxillomandibular advancement (MMA) is considered the most effective surgery for people with sleep apnea, because it increases the posterior airway space (PAS). However, health professionals are often unsure as to who should be referred for surgery and when to do so: some factors in referral may include failed use of CPAP or device use; anatomy which favors rather than impedes surgery; or significant craniofacial abnormalities which hinder device use. 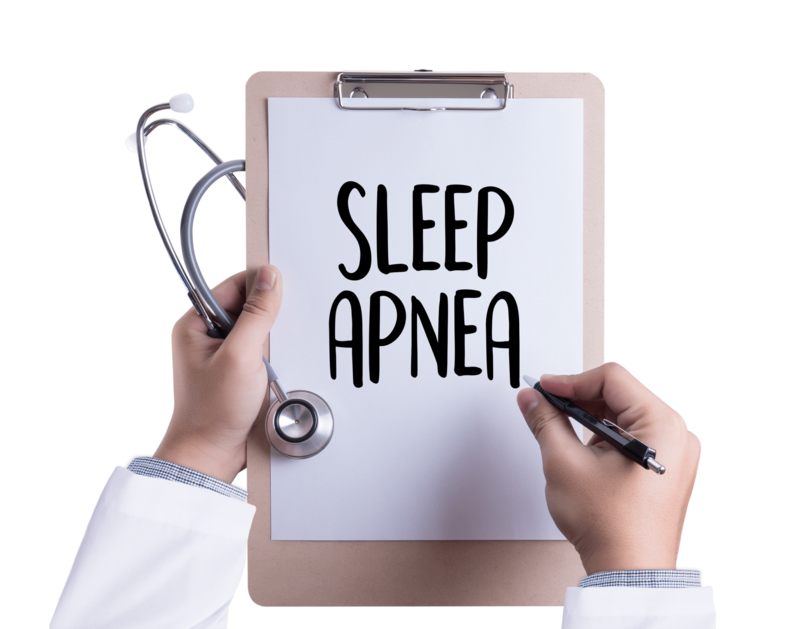 A person with sleep apnea undergoing any medical treatment must make sure his or her doctor and anesthetist are informed about the sleep apnea. 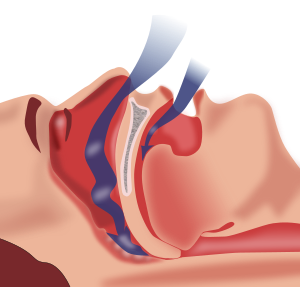 Alternative and emergency procedures may be necessary to maintain the airway of sleep apnea patients. Diaphragm pacing, which involves the rhythmic application of electrical impulses to the diaphragm, has been used to treat central sleep apnea. In April 2014 the U.S. Food and Drug Administration granted pre-market approval for use of an upper airway stimulation system in people who cannot use a continuous positive airway pressure device. The Inspire Upper Airway Stimulation system senses respiration and applies mild electrical stimulation during inspiration, which pushes the tongue slightly forward to open the airway. There is limited evidence for medication but acetazolamide “may be considered” for the treatment of central sleep apnea; it also found that zolpidem and triazolam may be considered for the treatment of central sleep apnea, but “only if the patient does not have underlying risk factors for respiratory depression”. Low doses of oxygen are also used as a treatment for hypoxia but are discouraged due to side effects. An oral appliance, often referred to as a mandibular advancement splint, is a custom-made mouthpiece that shifts the lower jaw forward and opens the bite slightly, opening up the airway. These devices can be fabricated by a general dentist. Oral appliance therapy (OAT) is usually successful in patients with mild to moderate obstructive sleep apnea. While CPAP is more effective for sleep apnea than oral appliances, oral appliances do improve sleepiness and quality of life and are often better tolerated than CPAP. Nasal EPAP is a bandage-like device placed over the nostrils that utilizes a person’s own breathing to create positive airway pressure to prevent obstructed breathing. Oral pressure therapy utilizes a device that creates a vacuum in the mouth, pulling the soft palate tissue forward. It has been found useful in about 25 to 37% of people. The Wisconsin Sleep Cohort Study estimated in 1993 that roughly one in every 15 Americans was affected by at least moderate sleep apnea. It also estimated that in middle-age as many as nine percent of women and 24 percent of men were affected, undiagnosed and untreated. The costs of untreated sleep apnea reach further than just health issues. It is estimated that in the U.S. the average untreated sleep apnea patient’s annual health care costs $1,336 more than an individual without sleep apnea. This may cause $3.4 billion/year in additional medical costs. Whether medical cost savings occur with treatment of sleep apnea remains to be determined. The clinical picture of this condition has long been recognized as a character trait, without an understanding of the disease process. The term “Pickwickian syndrome” that is sometimes used for the syndrome was coined by the famous early 20th century physician, William Osler, who must have been a reader of Charles Dickens. The description of Joe, “the fat boy” in Dickens’s novel The Pickwick Papers, is an accurate clinical picture of an adult with obstructive sleep apnea syndrome. The early reports of obstructive sleep apnea in the medical literature described individuals who were very severely affected, often presenting with severe hypoxemia, hypercapnia and congestive heart failure. The management of obstructive sleep apnea was improved with the introduction of continuous positive airway pressure (CPAP), first described in 1981 by Colin Sullivan and associates in Sydney, Australia. The first models were bulky and noisy, but the design was rapidly improved and by the late 1980s CPAP was widely adopted. The availability of an effective treatment stimulated an aggressive search for affected individuals and led to the establishment of hundreds of specialized clinics dedicated to the diagnosis and treatment of sleep disorders. Though many types of sleep problems are recognized, the vast majority of patients attending these centers have sleep-disordered breathing. Sleep apnea awareness day is April 18 in recognition of Colin Sullivan. “Sleep Apnea: What Is Sleep Apnea?”. NHLBI: Health Information for the Public. U.S. Department of Health and Human Services. July 10, 2012. Archived from the original on August 19, 2016. Retrieved 2016-08-18. “What Are the Signs and Symptoms of Sleep Apnea?”. NHLBI. July 10, 2012. Archived from the original on 26 August 2016. Retrieved 18 August 2016. Global Surveillance, Prevention and Control of Chronic Respiratory Diseases: A Comprehensive Approach. World Health Organization. 2007. p. 32. ISBN 9789241563468. Archived from the original on 2016-08-22. “Who Is at Risk for Sleep Apnea?”. NHLBI. July 10, 2012. Archived from the original on 26 August 2016. Retrieved 18 August 2016. “How Is Sleep Apnea Diagnosed?”. NHLBI. July 10, 2012. Archived from the original on 11 August 2016. Retrieved 18 August 2016. Ferri, Fred F. (2014). Ferri’s Clinical Advisor 2015: 5 Books in 1. Elsevier Health Sciences. p. 1090. ISBN 9780323084307. Archived from the original on 2016-08-23. De Backer, W (June 2013). “Obstructive sleep apnea/hypopnea syndrome”. Panminerva medica. 55 (2): 191–5. PMID 23676959. “How Is Sleep Apnea Treated?”. NHLBI. July 10, 2012. Archived from the original on 27 August 2016. Retrieved 18 August 2016. Auth, Patrick C. (2012). Physician Assistant Review (4 ed.). Lippincott Williams & Wilkins. p. 40. ISBN 9781451171297. Archived from the original on 2016-08-23. Yentis, Steven M.; Hirsch, Nicholas P.; Ip, James (2013). Anaesthesia and Intensive Care A-Z: An Encyclopedia of Principles and Practice. Elsevier Health Sciences. p. 428. ISBN 9780702053757. Archived from the original on 2016-08-23. El-Ad B, Lavie P (2005). “Effect of sleep apnea on cognition and mood”. International Review of Psychiatry (Abingdon, England). 17 (4): 277–82. doi:10.1080/09540260500104508. PMID 16194800. “Diagnosis and Treatment of Obstructive Sleep Apnea in Adults”. AHRQ Effective Health Care Program. August 8, 2011. Archived from the original on December 31, 2016. . A 2012 surveillance update Archived 2017-01-25 at the Wayback Machine. found no significant information to update. Aloia MS, Sweet LH, Jerskey BA, Zimmerman M, Arnedt JT, Millman RP (2009). “Treatment effects on brain activity during a working memory task in obstructive sleep apnea”. Journal of Sleep Research. 18 (4): 404–10. doi:10.1111/j.1365-2869.2009.00755.x. PMID 19765205. Sculthorpe LD, Douglass AB (July 2010). “Sleep pathologies in depression and the clinical utility of polysomnography”. Can J Psychiatry. 55 (7): 413–21. PMID 20704768. Morgenstern M, Wang J, Beatty N, Batemarco T, Sica AL, Greenberg H (2014). “Obstructive sleep apnea: an unexpected cause of insulin resistance and diabetes”. Endocrinology and Metabolism Clinics of North America. 43 (1): 187–204. doi:10.1016/j.ecl.2013.09.002. PMID 24582098. Ahmed MH, Byrne CD (2010). “Obstructive sleep apnea syndrome and fatty liver: association or causal link?”. World J Gastroenterol. 16 (34): 4243–52. doi:10.3748/wjg.v16.i34.4243. PMC 2937104  . PMID 20818807. H Singh; R Pollock; J Uhanova; M Kryger; K Hawkins; GY Minuk (2005). “Symptoms of Obstructive Sleep Apnea in Patients with Nonalcoholic Fatty Liver Disease”. Digestive Diseases and Sciences. 50 (12): 2338–2343. doi:10.1007/s10620-005-3058-y. F Tanne; F Gagnadoux; O Chazouilleres; B Fleury; D Wendum; E Lasnier; B Labeau; R Poupon; L Serfaty (2005). “Chronic Liver Injury During Obstructive Sleep Apnea”. Hepatology. 41 (6): 1290–1296. doi:10.1002/hep.20725. “Sleep Apnea Health Center”. WebMD. Archived from the original on 2014-05-02. Mayo Clinic. “Sleep apnea”. Archived from the original on 2014-04-30. “What Is Sleep Apnea?”. Nhlbi health. Archived from the original on 2015-08-20. Green, Simon. Biological Rhythms, Sleep and Hyponosis. England: Palgrave Macmillan. p. 85. ISBN 978-0-230-25265-3. Redline S, Budhiraja R, Kapur V, Marcus CL, Mateika JH, Mehra R, Parthasarthy S, Somers VK, Strohl KP, Sulit LG, Gozal D, Wise MS, Quan SF (2007). “Reliability and validity of respiratory event measurement and scoring”. J Clin Sleep Med. 3 (2): 169–200. PMID 17557426. AASM Task Force (1999). “Sleep–Related Breathing Disorders in Adults – Recommendations for Syndrome Definition and Measurement Techniques in Clinical Research”. Sleep. 22 (5): 667–689. PMID 10450601. Ruehland WR, Rochford PD, O’Donoghue FJ, Pierce RJ, Singh P, Thornton AT (2009). “The new aasm criteria for scoring hypopneas: Impact on the apnea hypopnea index”. Sleep. 32 (2): 150–157. PMC 2635578  . PMID 19238801. “AASM releases position statement on home sleep apnea testing – American Academy of Sleep Medicine – Association for Sleep Clinicians and Researchers”. aasm.org. Retrieved 18 October 2017. Whitelaw WA, Brant RF, Flemons WW (2005). “Clinical usefulness of home oximetry compared with polysomnography for assessment of sleep apnea”. Am J Respir Crit Care Med. 171 (2): 188–93. doi:10.1164/rccm.200310-1360OC. PMID 15486338. Archived from the original on 2016-01-26. Caples SM. “The accuracy of physicians in predicting successful treatment response in suspected obstructive sleep apnea did not differ between home monitoring and polysomnography”. ACP J Club. 143: 21. PMID 15989309. Morgenthaler TI, Kagramanov V, Hanak V, Decker PA (September 2006). “Complex sleep apnea syndrome: is it a unique clinical syndrome?”. Sleep. 29 (9): 1203–9. PMID 17040008. Archived from the original on 2011-04-11. Lay summary – Science Daily (September 4, 2006). “Sleep Apnea: Who Is At Risk for Sleep Apnea?”. NHLBI: Health Information for the Public. U.S. Department of Health and Human Services. Archived from the original on 2010-07-21. Neill AM, Angus SM, Sajkov D, McEvoy RD (January 1997). “Effects of sleep posture on upper airway stability in patients with obstructive sleep apnea”. American Journal of Respiratory and Critical Care Medicine. 155 (1): 199–204. doi:10.1164/ajrccm.155.1.9001312. PMID 9001312. Xiheng, Guo; Chen, Wang; Hongyu, Zhang; Weimin, Kong; Li, An; Li, Liu; Xinzhi, Weng (2003). “The Study Of The Influence Of Sleep Position On Sleep Apnea”. Cardinal Health. Archived from the original on 2014-06-26. Loord H, Hultcrantz E (August 2007). “Positioner—a method for preventing sleep apnea”. Acta Oto-laryngologica. 127 (8): 861–8. doi:10.1080/00016480601089390. PMID 17762999. Szollosi I, Roebuck T, Thompson B, Naughton MT (August 2006). “Lateral sleeping position reduces severity of central sleep apnea / Cheyne–Stokes respiration”. Sleep. 29 (8): 1045–51. PMID 16944673. Archived from the original on 2011-04-11. Vennelle M, White S, Riha RL, Mackay TW, Engleman HM, Douglas NJ (February 2010). “Randomized controlled trial of variable-pressure versus fixed-pressure continuous positive airway pressure (CPAP) treatment for patients with obstructive sleep apnea/hypopnea syndrome (OSAHS)”. Sleep. 33 (2): 267–71. PMC 2817914  . PMID 20175411. Morris LG, Kleinberger A, Lee KC, Liberatore LA, Burschtin O (November 2008). “Rapid risk stratification for obstructive sleep apnea, based on snoring severity and body mass index”. Otolaryngology-Head and Neck Surgery. 139 (5): 615–8. doi:10.1016/j.otohns.2008.08.026. PMID 18984252. Yan-fang S, Yu-ping W (August 2009). “Sleep-disordered breathing: impact on functional outcome of ischemic stroke patients”. Sleep Medicine. 10 (7): 717–9. doi:10.1016/j.sleep.2008.08.006. PMID 19168390. Bixler EO, Vgontzas AN, Lin HM, Liao D, Calhoun S, Fedok F, Vlasic V, Graff G (November 2008). “Blood pressure associated with sleep-disordered breathing in a population sample of children”. Hypertension. 52 (5): 841–6. doi:10.1161/HYPERTENSIONAHA.108.116756. PMC 3597109  . PMID 18838624. Leung RS (2009). “Sleep-disordered breathing: autonomic mechanisms and arrhythmias”. Progress in Cardiovascular Diseases. 51 (4): 324–38. doi:10.1016/j.pcad.2008.06.002. PMID 19110134. Silverberg DS, Iaina A, Oksenberg A (January 2002). “Treating obstructive sleep apnea improves essential hypertension and life”. American Family Physician. 65 (2): 229–36. PMID 11820487. Archived from the original on 2008-05-13. Grigg-Damberger M (February 2006). “Why a polysomnogram should become part of the diagnostic evaluation of stroke and transient ischemic attack”. Journal of Clinical Neurophysiology. 23 (1): 21–38. doi:10.1097/01.wnp.0000201077.44102.80. PMID 16514349. Yaggi HK, Concato J, Kernan WN, Lichtman JH, Brass LM, Mohsenin V (November 2005). “Obstructive sleep apnea as a risk factor for stroke and death”. The New England Journal of Medicine. 353 (19): 2034–41. doi:10.1056/NEJMoa043104. PMID 16282178. Kumar R, Birrer BV, Macey PM, Woo MA, Gupta RK, Yan-Go FL, Harper RM (June 2008). “Reduced mammillary body volume in patients with obstructive sleep apnea”. Neuroscience Letters. 438 (3): 330–4. doi:10.1016/j.neulet.2008.04.071. PMID 18486338. Kumar R, Birrer BV, Macey PM, Woo MA, Gupta RK, Yan-Go FL, Harper RM (June 2008). “Reduced mammillary body volume in patients with obstructive sleep apnea”. Neuroscience Letters. 438 (3): 330–4. doi:10.1016/j.neulet.2008.04.071. PMID 18486338. Lay summary – Newswise (June 6, 2008). Khan MT, Franco RA (2014). “Complex sleep apnea syndrome”. Sleep Disord. 2014: 798487. doi:10.1155/2014/798487. PMC 3945285  . PMID 24693440. “How Is Sleep Apnea Treated?”. National Heart, Lung, and Blood Institute. Archived from the original on 2007-10-13. Aurora RN; et al. (Jan 2012). “The treatment of central sleep apnea syndromes in adults: practice parameters with an evidence-based literature review and meta-analyses”. Sleep. 35 (1): 17–40. doi:10.5665/sleep.1580. PMC 3242685  . PMID 22215916. Spicuzza, L; Caruso, D; Di Maria, G (September 2015). “Obstructive sleep apnoea syndrome and its management”. Therapeutic advances in chronic disease. 6 (5): 273–85. doi:10.1177/2040622315590318. PMC 4549693  . PMID 26336596. Yu, J; Zhou, Z; McEvoy, RD; Anderson, CS; Rodgers, A; Perkovic, V; Neal, B (11 July 2017). “Association of Positive Airway Pressure With Cardiovascular Events and Death in Adults With Sleep Apnea: A Systematic Review and Meta-analysis”. JAMA. 318 (2): 156–166. doi:10.1001/jama.2017.7967. PMID 28697252. Gottlieb, Daniel J. (11 July 2017). “Does Obstructive Sleep Apnea Treatment Reduce Cardiovascular Risk?”. JAMA. 318 (2): 128. doi:10.1001/jama.2017.7966. Iftikhar, IH; Khan, MF; Das, A; Magalang, UJ (April 2013). “Meta-analysis: continuous positive airway pressure improves insulin resistance in patients with sleep apnea without diabetes”. Annals of the American Thoracic Society. 10 (2): 115–20. doi:10.1513/annalsats.201209-081oc. PMC 3960898  . PMID 23607839. Haentjens, P; Van Meerhaeghe, A; Moscariello, A; De Weerdt, S; Poppe, K; Dupont, A; Velkeniers, B (23 April 2007). “The impact of continuous positive airway pressure on blood pressure in patients with obstructive sleep apnea syndrome: evidence from a meta-analysis of placebo-controlled randomized trials”. Archives of Internal Medicine. 167 (8): 757–64. doi:10.1001/archinte.167.8.757. PMID 17452537. Patel, SR; White, DP; Malhotra, A; Stanchina, ML; Ayas, NT (10 March 2003). “Continuous positive airway pressure therapy for treating sleepiness in a diverse population with obstructive sleep apnea: results of a meta-analysis”. Archives of Internal Medicine. 163 (5): 565–71. doi:10.1001/archinte.163.5.565. PMID 12622603. Hsu AA, Lo C (December 2003). “Continuous positive airway pressure therapy in sleep apnoea”. Respirology. 8 (4): 447–54. doi:10.1046/j.1440-1843.2003.00494.x. PMID 14708553. Young, Terry; Peppard, Paul E.; Gottlieb, Daniel J. (May 2002). “Epidemiology of Obstructive Sleep Apnea”. American Journal of Respiratory and Critical Care Medicine. 165 (9): 1217–1239. doi:10.1164/rccm.2109080. Tuomilehto, Henri P. I.; Seppä, Juha M.; Partinen, Markku M.; Peltonen, Markku; Gylling, Helena; Tuomilehto, Jaakko O. I.; Vanninen, Esko J.; Kokkarinen, Jouko; Sahlman, Johanna K.; Martikainen, Tarja; Soini, Erkki J. O.; Randell, Jukka; Tukiainen, Hannu; Uusitupa, Matti (15 February 2009). “Lifestyle Intervention with Weight Reduction”. American Journal of Respiratory and Critical Care Medicine. 179 (4): 320–327. doi:10.1164/rccm.200805-669OC. Choi, Ji Ho; Kim, Soo-Nyung; Cho, Jae Hoon (2013-01-01). “Efficacy of the Pillar implant in the treatment of snoring and mild-to-moderate obstructive sleep apnea: a meta-analysis”. The Laryngoscope. 123 (1): 269–276. doi:10.1002/lary.23470. ISSN 1531-4995. PMID 22865236. Prinsell JR (November 2002). “Maxillomandibular advancement surgery for obstructive sleep apnea syndrome”. Journal of the American Dental Association. 133 (11): 1489–97; quiz 1539–40. doi:10.14219/jada.archive.2002.0079. PMID 12462692. MacKay, Stuart (June 2011). “Treatments for snoring in adults”. Australian Prescriber (34): 77–79. Archived from the original on 2011-06-21. “What is Sleep Apnea?”. National Heart, Lung, and Blood Institute. National Institutes of Health. 2012. Archived from the original on 28 August 2011. Retrieved 15 February 2013. Bhimji, S. (16 December 2015). Mosenifar, Z., ed. “Overview – Indications and Contraindications”. Medscape – Diaphragm Pacing. WebMD LLC. Archived from the original on 28 April 2016. Retrieved 19 February 2016. Yun, AJ; Lee, PY; Doux, JD (May 2007). “Negative pressure ventilation via diaphragmatic pacing: a potential gateway for treating systemic dysfunctions”. Expert review of medical devices. 4 (3): 315–9. doi:10.1586/17434440.4.3.315. PMID 17488226. “Inspire Upper Airway Stimulation – P130008”. FDA.gov. Food and Drug Administration. 11 January 2016. Archived from the original on 11 March 2016. Retrieved 9 March 2016. “Sleep Apnea”. Diagnosis Dictionary. Psychology Today. Archived from the original on 2010-01-17. Mayos M, Hernández Plaza L, Farré A, Mota S, Sanchis J (February 2001). “[The effect of nocturnal oxygen therapy in patients with sleep apnea syndrome and chronic airflow limitation]”. Archivos de Bronconeumología (in Spanish). 37 (2): 65–8. doi:10.1016/S0300-2896(01)75016-8. PMID 11181239. Breitenbücher A, Keller-Wossidlo H, Keller R (November 1989). “[Transtracheal oxygen therapy in obstructive sleep apnea syndrome]”. Schweizerische Medizinische Wochenschrift (in German). 119 (46): 1638–41. PMID 2609134. Machado MA, Juliano L, Taga M, de Carvalho LB, do Prado LB, do Prado GF (December 2007). “Titratable mandibular repositioner appliances for obstructive sleep apnea syndrome: are they an option?”. Sleep & Breathing. 11 (4): 225–31. doi:10.1007/s11325-007-0109-y. PMID 17440760. Chen, Hui; Lowe, Alan A. (6 May 2012). “Updates in oral appliance therapy for snoring and obstructive sleep apnea”. Sleep and Breathing. 17 (2): 473–486. doi:10.1007/s11325-012-0712-4. Chen, Hui; Lowe, Alan A. (6 May 2012). “Updates in oral appliance therapy for snoring and obstructive sleep apnea”. Sleep and Breathing. 17 (2): 473–486. doi:10.1007/s11325-012-0712-4. ISSN 1520-9512. Riaz, M; Certal, V; Nigam, G; Abdullatif, J; Zaghi, S; Kushida, CA; Camacho, M (2015). “Nasal Expiratory Positive Airway Pressure Devices (Provent) for OSA: A Systematic Review and Meta-Analysis”. Sleep disorders. 2015: 734798. doi:10.1155/2015/734798. PMC 4699057  . PMID 26798519. Nigam, Guarav (May 2016). “Effectiveness of oral pressure therapy in obstructive sleep apnea: a systematic analysis”. Sleep and Breathing. 20 (2): 663–671. doi:10.1007/s11325-015-1270-3. PMID 26483265. Colrain, Ian M.; et. al. (Sep 2013). “A multicenter evaluation of oral pressure therapy for the treatment of obstructive sleep apnea”. Sleep Medicine. 14 (9): 830–837. doi:10.1016/j.sleep.2013.05.009. PMC 3932027  . Young T, Palta M, Dempsey J, Skatrud J, Weber S, Badr S (April 1993). “The occurrence of sleep-disordered breathing among middle-aged adults”. The New England Journal of Medicine. 328 (17): 1230–5. doi:10.1056/NEJM199304293281704. PMID 8464434. Lee W, Nagubadi S, Kryger MH, Mokhlesi B (June 1, 2008). “Epidemiology of obstructive sleep apnea: a population-based perspective”. Expert Rev Respir Med. 2 (3): 349–64. doi:10.1586/17476348.2.3.349. PMC 2727690  . PMID 19690624. Young T, Peppard PE, Gottlieb DJ (May 2002). “Epidemiology of obstructive sleep apnea: a population health perspective”. American Journal of Respiratory and Critical Care Medicine. 165 (9): 1217–39. doi:10.1164/rccm.2109080. PMID 11991871. Kapur V, Blough DK, Sandblom RE, Hert R, de Maine JB, Sullivan SD, Psaty BM (September 1999). “The medical cost of undiagnosed sleep apnea”. Sleep. 22 (6): 749–55. PMID 10505820. Archived from the original on 2011-04-11. Kryger MH (1985). “Fat, sleep, and Charles Dickens: literary and medical contributions to the understanding of sleep apnea”. Clin. Chest Med. 6: 555–62. PMID 3910333. Sullivan CE, Issa FG, Berthon-Jones M, Eves L (April 1981). “Reversal of obstructive sleep apnoea by continuous positive airway pressure applied through the nares”. Lancet. 1 (8225): 862–5. doi:10.1016/S0140-6736(81)92140-1. PMID 6112294. Sichtermann, Lori. “Industry Recognizes Sleep Apnea Awareness Day 2014”. Sleep Review. Archived from the original on 30 April 2014. Retrieved 30 April 2014.